Businesses in the Borders are starting to see the benefit of a wind farm that will be constructed between Grantshouse and Duns. The pre construction phase is now underway at the Quixwood Moor Wind Farm and local contractors have been called in to carry out some of the site investigation work. Banks Renewables, the Hamilton based wind energy firm behind the project, committed to using local firms, wherever possible during the planning application stage and that commitment is now being realised with some of the earliest contracts being awarded to Borders businesses. 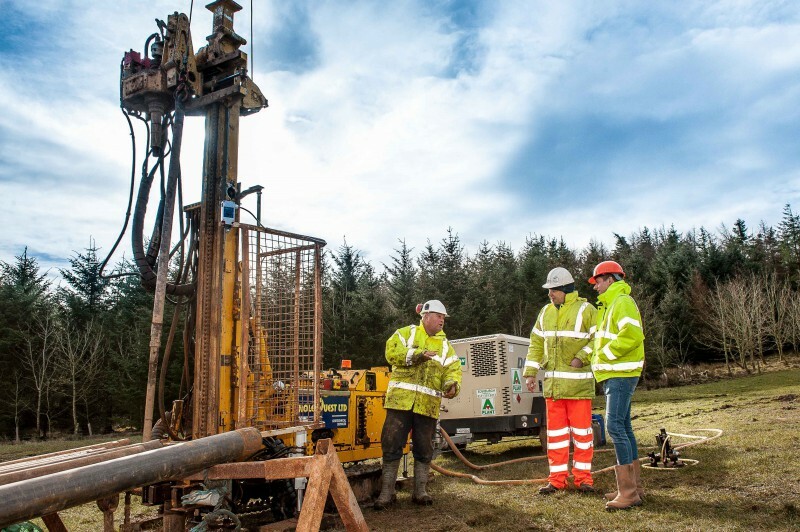 Galashiels based Holequest, has been contracted to provide excavation, site management and borehole drilling services at the site. Craig Rodger, technical manager for the firm, which employs 26 people, believes Banks Renewables’ commitment to use local Borders firms where at all possible could prove hugely beneficial to the local economy. He said: “It’s great to see Banks Renewables commit to using local companies where possible in the development of its wind farms. “Often developers will use the same contractors regardless of location and many just decide on price, which means that the communities hosting the wind farms don’t feel any economic boost. The 13 turbine wind farm will generate up to 29.9MW of energy per year once fully operational. In total, local businesses will have the opportunity to bid for approximately £6.4million in contracts during its construction. Miles Crossley, senior business development manager at Banks Renewables said: “Banks Renewables is committed to maximising the contracting opportunities for local firms and giving priority to placing local businesses on tender lists wherever possible so they can benefit from the construction of our wind farms. “It’s great to see a local business like Holequest carrying out specialist work at the Quixwood Moor site. “This stage of the development is very exciting and we are delighted to see that the commitment we showed to local businesses in the early stages of planning is now shining through at the pre construction stage. “The input and feedback of local families and business was of crucial importance during the development phase of the wind farm so it’s great to see this economic benefit being realised at such an early stage. Banks Renewables is committed to establishing a Quixwood wind Farm Community Fund, which would direct some of the revenues of the wind farm towards local community projects and groups helping to improve facilities and fund some key initiatives. The fund is expected to see at least £2.5 million being ring-fenced for local community groups, charities and voluntary organisations and crucially the fund would be used to target local issues that are identified by local people, with communities agreeing where funding should be directed.